Made with malted Cadbury milk chocolate. No added colours.Cadbury Pots of Joy Milk Chocolate Potted Desserts are the milk chocolate lovers dream. 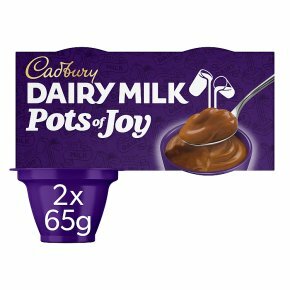 Smooth and creamy enjoy this Cadbury milk chocolate smooth potted dessert as the perfect lunchtime or after dinner treat.